But styling that growing bump doesn’t have to take a lot of time, effort of money. These maternity dress styles are flattering, fun and functional – and many convert to nursing style so you can keep on wearing those pieces when bub arrives! The first tip to think about with maternity dressing is to consider in which season will you be showing off your bump. Summer will call for the comfiest loose, flowy pieces like maxi dresses and tops paired with shorts. If you’re having a winter pregnancy or live somewhere cold, you’ll want a jacket or coat to layer over all of your clothes. All year round you’ll love showing off that bump in a great pair of maternity jeans or leggings. When selecting a size the general rule of thumb is to try a maternity dress in your pre-pregnancy size, as the measurements will cater for the growing bump. But select something that’s comfiest for you, which may mean going up a size if you would like more room in the arms or bust. Never underestimate the power of wearing outfits which make you feel good during your pregnancy as it can be a difficult time with so many changes happening in your body. A few staple pieces as well a couple of standout dresses will have you glowing for any occasion – baby shower, work, special occasion and casual days out – as your bump kicks away. We’ve compiled a few options for dressing that bump to minimise fuss so you can focus on those more important concerns for the little bundle - like nursery décor... or taking an extra nap. There are fabulous dress options to match your theme. Pink is flattering and oh so cute for dressing up your bump ready to celebrate the new miss on her way. Try the Nelson Strapless Nursing Maxi in Persian Rose (with nursing capability so you can keep wearing this beauty postpartum). For an at-home relaxed baby shower celebration, wear it with a cropped cardigan and low wedges. To dress this outfit up, go for some metallic heels or ballet flats, a chunky necklace and a floral headpiece. A baby boy on the way? 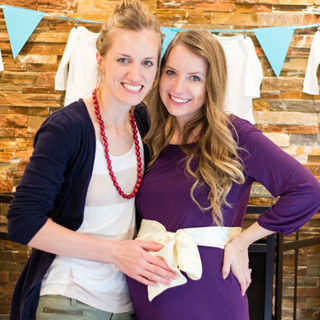 There are plenty of options to suit your baby shower theme with a wide range of blue and flattering green maternity dresses to help you glow. The Nadia Tiered Midi Dress in blue is made from comfy polyester with a free flowing design and loose silhouette. Its layered long sleeves with cuffs and tiered design makes it dressy enough to wear to your shower or a lunch date, but can also be dressed down with some flats for a day in the office. If your new bub’s gender isn’t being revealed – why not play with the idea of wearing something with a mix of both pink and blue? There are a wide range of multi-coloured maternity dresses perfect for a baby shower or gender reveal party to play on the idea. The Ellie Nursing Tank Dress is full of colour and ready to stretch to fit any sized bump. Looking for something a little different? Browse plenty more Baby Shower Dresses here. A question as old as time itself: when attending a formal event (like a wedding or a party), should you go for the little black dress or an outfit with a splash of colour to stand out? No matter which way you decide to go, dressing up your bump and feeling great on your feet in these last few months before the stork’s arrival will keep you smiling. The Kaia Ruched Off Shoulder Nursing Dress in black is a great option, with its off-the shoulder design, deep frill, elasticised empire waist, and side ruching down full length of dress. Dress the black up with glittery accessories, a bright clutch or blazer and you’re ready to wow. The Tiffany Rose Bardot Dress in Grand Jardin is the epitome of fabulous formal wear. A jersey maternity dress with a low v-neckline front and back, it also features an elasticised empire line, straight skirt, and is fully lined and nursing friendly. Pair with accessories to suit the florals or base colour for your formal event. For plenty more special occasion maternity dresses, take a look at the full range here. There are a wide range of effortless, relaxed looks in maternity casual dresses. You get to keep looking as ‘you’ as you want during your pregnancy, and we’ve found a few casual looks so you can stay on the couch with those swollen feet up a little longer. Go for neutral tones to flatter. Floressa's Clayton Nursing Tank Dress in Grey is a beautiful go-to. Add a blazer to head into the office or add sneakers for some baby shopping or brunch with friends. This jersey maternity tank dress has a scoop neckline, side gathering and hidden snap buttons on the shoulders for nursing capability. Looking for bold and bright? Try the stripey Zara Pocket Dress. 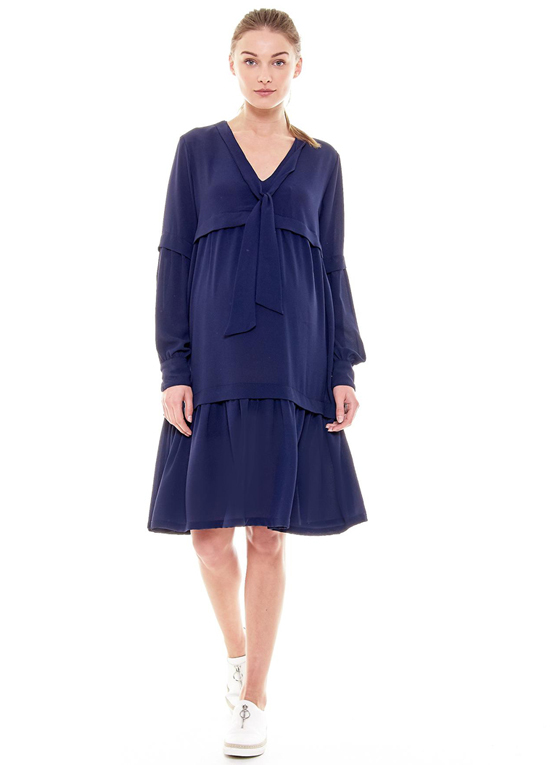 This jersey maternity dress has a v-neckline, short batwing sleeves, and side pockets for ultimate comfort. It can be worn with flats or boots depending on the time of year - perfect for everything from the footy to the movies. A pinafore dress is the cool casual you need. Feel fabulous in the Supermom Black Denim Pinafore Dress, a denim maternity pinafore dress with adjustable shoulder straps, a front centre pocket, and a side zipper. Perfect for any season, you can pair it with a striped tee underneath for weekend shopping or with a long-sleeved top for the cooler months. The options are endless for your casual maternity dresses. Check out our casual range here. Chic and effortless (hello – less ironing) work dresses complete a maternity corporate look. The Guilia Knit Nursing Dress is a ribbed knit faux wrap dress, with layered crossover v-neckline, long sleeves, and attached ties. This dress will have you feeling comfy under that office aircon, and is also made for nursing so you can keep wearing it after bub has arrived. For something a little more dressy in the office and beyond, the Eden Nursing Dress is an incredibly chic choice. It has short cap sleeves and elegant side ruching to accommodate your baby bump during pregnancy, and the outer pulls aside for discreet breastfeeding later. We’ve got your whole maternity work wardrobe covered with our work dresses section. The epitome of comfort and cool, pick something long enough to hide flats with swollen feet (something that seems to be a given in pregnancy!). For a maxi dresses to impress, look no further than the Alana Maxi Dress in Night Blossom. Whether you’re headed on a parents-to-be date night or to a daytime party, this fluid jersey material dress will have you turning heads. It also features a low v-neckline front and back, elasticised empire line, a-line skirt, cap sleeves and is nursing friendly. For a more casual maxi, opt for the neutral and bright white Aria Striped Maxi Dress. Comfort is key here! Can’t get enough maxis? There are plenty more on offer right here. With all of these event categories covered, your wardrobe decisions will be simple all throughout your pregnancy, leaving you to focus on all the other important decisions this exciting time calls for!